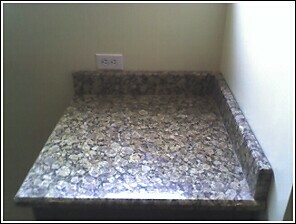 In case you haven't figured it out yet-- yesterday was our granite day. 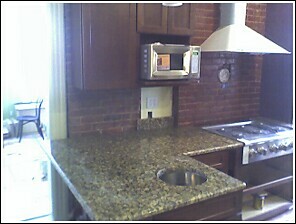 The granite guys were supposed to arrive between 12 and 4 pm. Naturally, and as one could easily expect from our past history with workmen glorious and not so, this was not to be the case. Anyway, at least on one occasion, her thought of the right location for a certain hallway light was really the wrong location, and the location that I selected was the right location. It sounds hard to believe, but it's true. She has even admitted as such to me in private, but I'm not sure she'd be willing to admit the error of her ways in public. And unless I desire to sleep in a non-existent doghouse, I think we shall say "enough said" about this particular incident in our house-building situation and move on. So anyway, the granite guys were supposed to come today, as was the plumber Santanam and Stephanie took a half day off of work. (She went in from 8-12) Sadly, the plumber called to say he had to go to court for a summons, and the granite guys never really called at all. Around 1, I called them, and they said they'd be running late. How late, they were afraid to commit to. And by 5 when they didn't show up, we got worried-- we called them and said-- It has to be tonight-- Stephanie can't do it any other day. Well, to make a long story short, they rolled up around 9:30 or so. 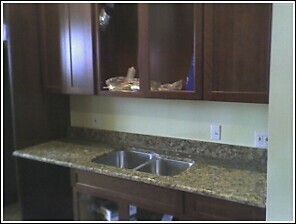 They were here until around 10:45 and they installed the granite. And it looks WONDERFUL! They will still have to come back to install a couple of backsplash pieces that were measured incorrectly, and there were a couple of minor measuring mishaps that needed to be corrected, but overall, it's mostly in. Of course, the plumber hasn't arrived today even, which means it will be Monday or Tuesday (knock wood) before the sinks are installed and working. But hey, it's progress. 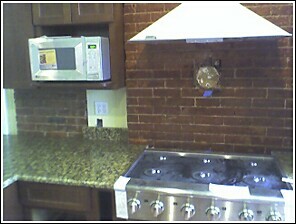 This is the cooktop with granite on either side-- the back of the cooktop still needs to be worked on, as well as the backsplashes for this wall. Comments on "We both got stoned late last night..."
Corked, moved and stoned. Bravo! And I guess on Monday we will hopefully be sunk! Good luck with your move.... and benefit from my lesson-- throw it out now!